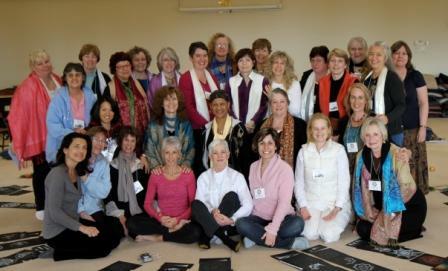 Authorized Mandala Facilitators studied Mandala Facilitation Training with Dr. Judith Cornell. Their purpose is to assist others in returning to their Inner Light. Those finding their Inner Light see numerous benefits. Mandala Facilitators come from all walks of life, have varied backgrounds and faiths. Participants and Facilitators at the 2010 Mandala Facilitation training event. Jane Hendrickson, Sara Goldsberry, Susan Burton, Sharon Murnane, Joan Malcolm. Middle row: Kaho Koinuma, Ruth Fuller, Claudia McFarlane, Kathleen Kinasewich, Laurie Fitzgerald. MANDALA Facilitators have trained extensively with Dr. Judith Cornell and are committed to compassionate service. They are certified to lead groups and give individual consultations. Although facilitators come from various spiritual paths, they are inclusive and honor all faith traditions. Facilitators hold the sacred space for you to transform your life. one day sessions, addictions personal growth, self care, and grief/loss. Three-day retreats and drop-in programs for those touched by cancer or chronic illness (including caregivers). Renewal retreats for nurses. CEU’s for nurses. classes for groups, individuals, adults, teens. retreats in support of all beings to discover peace, love and true happiness. exhibits, slideshow events (concerts, meditations, talks). (Japanese and English). Mandala workshops for adults or children with a focus on teacher institutes, youth ministry, religious retreats or Reiki retreats. Individual consultations are also available. individual sessions to support those facing cancer. organizations, group sand mandalas, QiGong, and drumming. Group sand mandala’s, retreats, children, adults, and individual consultations. Mandala Workshops for growth & self-care, Weekly Open Art Studio, Individual and Group Art Therapy Sessions, Art Classes. ages, private sessions for individuals and couples. Mandalas for holistic self-care: In-person and online – Individual and group sessions/workshops: adults, teens, children, community/family sand mandalas. Pedro Molina, PhDwww.astromandalas.comMandala programs: adults, children, group sand mandala’s and individual consultations. UNITEDKINGDOM(Bath and Wiltshire, England) Sonja Stoeckliwww.spiritualflowyoga.comMandala workshops with restorative yoga or pranayama. Supports spiritual growth and awareness, helping you find peace, love and light in your life.